For educators like me, history books for the classroom come in two varieties. The first, one all too many of us recollect, is the somber collection of names, dates, events and explanations followed by even more somber illustrations of very upright white men and stately occasions featuring white men doing what white men were thought to do: stand around, prance in short pants, sign documents, and slay indigenous populations without a hair out of place. The second was a movement to rectify the stuffy white man by using songs, poems, happy pictures and narrative tools to convey historical events. Many early childhood books fall into this category: the smiling Pilgrim, the smiling Wampanoag (at least before the smallpox), the happy colonists dumping tea while redcoats pout and look cross. Its cute, but some events just can’t be washed over with sappy narrative: Indian wars, insurrections and tarring and feathering a tax collector just don’t warrant smiling cherubs set to rhyme. Luckily, today’s book selection finds a unique balance between these two views. 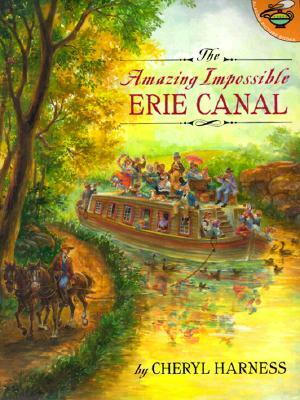 The Amazing Impossible Erie Canal, by Cheryl Harness, highlights the history, construction and opening of the Erie Canal from 1817 to 1825. Most readers know my penchant for New York history. But I have a real soft spot for the Erie Canal, and Harness’ work helps bridge that love to the classroom. There’s no exaggerating the importance of this 363-mile long ditch. The Erie Canal was among the most important public works projects in American history. It revolutionized transportation to the Great Lakes and the Middle West of the United States. It established New York City as a center of commerce, business and immigration. Thousands of settlers had a way into the interior of the United States. It was an incredible example of public and private enterprise working together. Nonetheless, all this impact would fall as flat as your old high school textbook. This is where Cheryl Harness’ magic comes in. We’ve seen Harness’ work before, in regards to women’s history and biographies. She has a real knack for packing lots of important information, while at the same time weaving a compelling narrative that rarely distracts the reader. Her books are, in a way, like busy local highways: lots of roadside attractions if you need them, but the traffic’s always moving so you can get to your destination. Erie Canal is no different. Harness’ highway is the 1825 celebrations that opened the canal. As the reader follows Governor DeWitt Clinton (The Neighborhood’s patron saint) on the canal from Buffalo to New York City, page after page is peppered with maps, graphs, pictures, and explanatory text about the building, technology and impact of the canal. One scene is particularly poignant. As Clinton’s barge, the Seneca Chief, goes from town to town, the townspeople all gather to welcome her. The old veterans of the Revolutionary War, in fact, put on their old uniforms and medals in salute to this great achievement. Its a great example to show how Americans of all generations got together to celebrate, even 180 years ago. A history book on the Erie Canal could have easily turned into a snoozer with portraits and dry writing. It could’ve also turned into another crappy kids’ pap about that damn song with a mule named Sal. Harness skillfully managed to avoid both. In The Amazing Impossible Erie Canal, she provided that rare breed of picture history that is both fun to read and rich in detailed information. As for those old “white man” books, save them for college, so that your professors can rip them to shreds.